Fill a large mason jar ¾ of the way with bourbon, add remaining ingredients, cover, and infuse for 24-48 hours. In a small saucepan on medium heat, bring ginger, sugar, and water to a simmer. Turn heat to low and gently simmer for 25 minutes. Strain and let cool to room temperature. Fill cocktail shaker ¼ of the way with ice. Add all ingredients except Christmas Ale and garnishes, place shaker pint on top, and shake vigorously until thoroughly mixed. 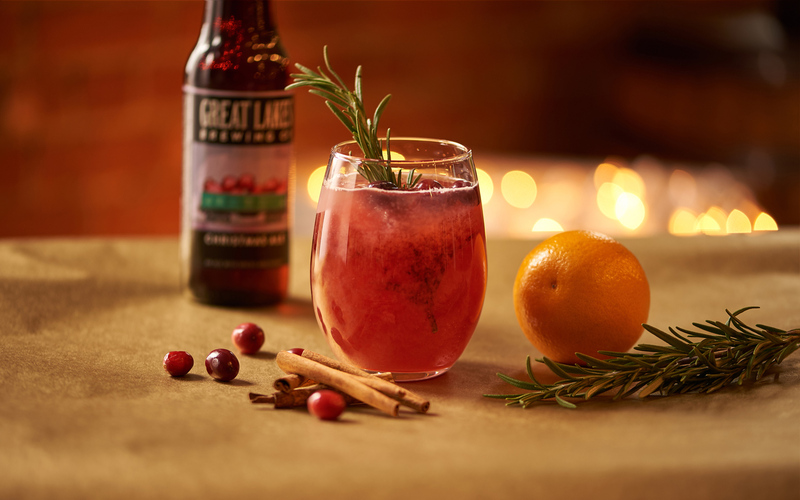 Pour into a highball or wine glass, top with Christmas Ale, and garnish with fresh cranberries and a rosemary sprig.